This convenient cushion is your solution to a flawless complexion. It covers imperfections like uneven skin tones and blemishes without looking cakey. It is light weight and blends very well, giving you a natural glow to your skin. Plus it also protects your skin from the harsh effects of the sun. Formulated with silica powder that absorbs excess facial oils and bamboo water that hydrates your skin. It is a multi-functional cushion that will gives your skin a youthful, silky finish. 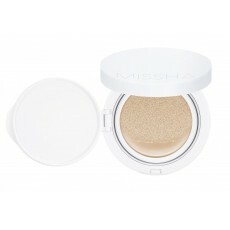 If you want to read a blog how Missha M Magic Cushion is unpacked and reviewed in a blog, please read here. After applying your sunscreen, puff lightly and apply to face starting at the center to the corners of your face. Always make sure to close the cap, to avoid drying of contents.